To begin with HAPPY NEW YEAR!!!!! Ok now I just finished marathoning this series. 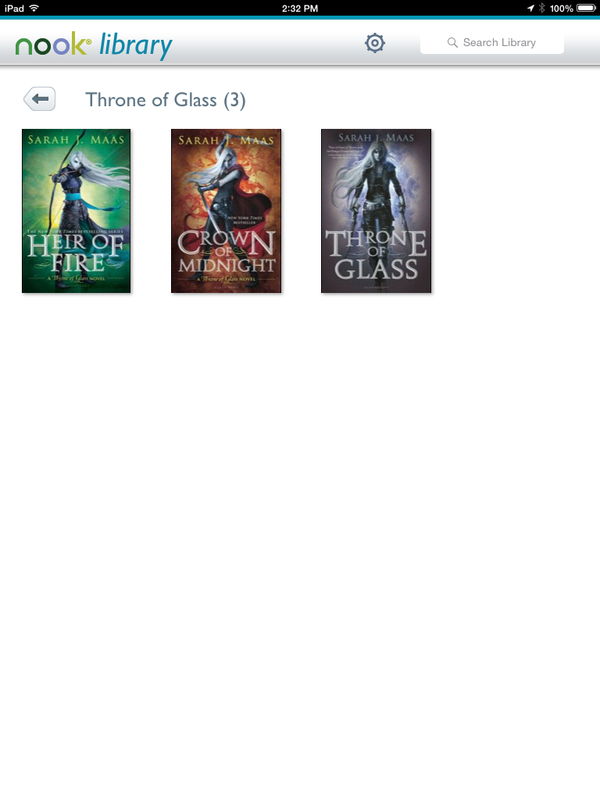 I had Throne of Glass sitting on my Nook bookshelf forever and finally decided to see what all the hype was about. All I can say is why did I wait so long????? This is going to be a 6 book series with the 4th book set to be released this year. Throne of Glass is the 1st book of the series and it is here where we introduced to a world under a tyrants rule. It follows the story of Celaena Sardothien who is…… Wait for it……. An assassin. She is in a prison (not your run of the mill American jails but a hard labor camp) and is offered release only if she agrees to compete to be the kings champion. Basically the tyrant that has destroyed the kingdom holds a competition in order to find a champion (personal assassin) to work for him. There is some romance, lots of action, plot twist, character growth, and just utter awesomeness. If this sounds interesting to you do not read any further go pick it up ASAP. I gave this first installment 5 out of 5. Crown of Midnight is the 2n book in the series so obviously I can’t go into great detail without spoiling the 1st book. I can however say this book define gel lived up to the 1st. I didn’t find myself bored at any point. I gave this book 5 out of 5 stars. If you read the 1st book you really won’t need to be convinced to pick up the 2nd I’m telling you. Heir of Fir is the 3rd book and ahhhhhh Sarah J Maas did it again. I’m not even sure how it’s possible but this book out did the other 2. We get new characters, more back story that helps understand the main characters, amazing world building, it is pure perfection!!!! I gave this book also 5 out of 5 stars but would if it wax possible give if 10 out of 5 stars. Go check this series out guys you won’t be disappointed. Happy Reading!!!!!!! I’m the same way lol I shop between Amazon, Google Play Books, Barnes and Noble (runs sells on ebooks), and also Book Outlet. Thanks for the book recommendation I’m adding Poison Study to my list!! I usually stick with amazon and google play since i use the kindle app on my phone ( hopefully ill get an actual kindle in Feb. Fingers crossed haha! ) ohhh book outlet? Ive never heard of that. No problem! Youll get hooked on the series. It involves magic, romance, and action! Hmm..i should write a review on it haha. Happy reading!